November 17, 2016, 7:14 p.m.
Last month, New York&apos;s Museum of Modern Art acquired the original set of 176 emojis released in 1999 by NTT DoCoMo, a Japanese phone company. That&apos;s right: the cute little characters scattered across social media and mobile devices are now part of art history. Another field that&apos;s grown to embrace the digital depictions of sparkling hearts and yellow smiley faces is advertising. Even the federal government, under President Obama, has employed the icons to grab the attention of Millennials. 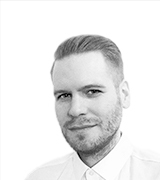 New data from YouGov Profiles, however, shows that brands might want to think twice before diving headfirst into the current fad. When asked if businesses are trying too hard when using emojis in advertising or corporate communications, 58% of the public agreed. Millennials aged 18-34, of course, feel more connected with emoji culture than their elders, who are more likely than not to admit they don&apos;t understand what many of the emojis mean. (Only 42% of Millennials say the same.) 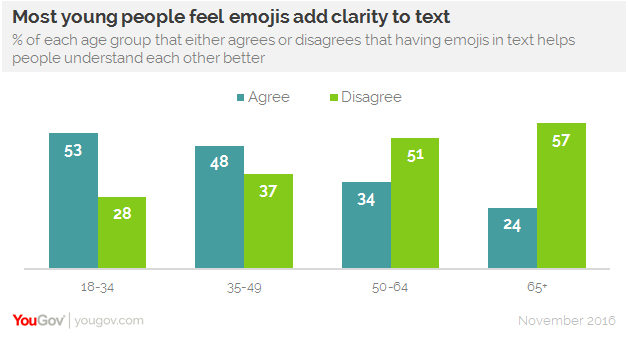 Meanwhile, 53% of young people think mixing emojis with text helps people better understand each other — yet another position that sets the Millennial generation apart from those that came before. 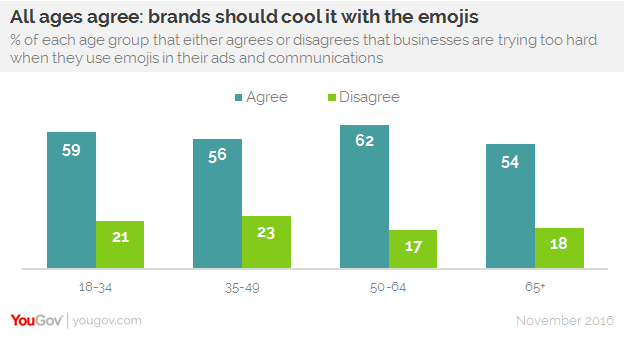 At the same time, however, 59% of Millennials aged 18-34 say brands are trying too hard when using emojis in their ad campaigns. It&apos;s a sentiment shared by all age groups. Consider Chevrolet. In the past couple years, the car manufacturer has issued a press release written entirely in the digital icons under the hashtag #CHEVYGOESEMOJI. The brand has also produced a TV commercial that features various focus groups evaluating the 2016 Chevy Cruze using nothing but emojis. Unfortunately for Chevrolet, 56% of consumers who indicate that they would consider purchasing one of the brand&apos;s models when next in the market for a new car agree that businesses are trying too hard with emojis. (The video embedded above, for example, has way more dislikes than likes on YouTube.) By comparison, only 41% of people open to buying a Buick, and 48% interested in a Kia, report feeling the same. Additional data shows that consumers who feel brands are going overboard with emojis are most likely to be males aged 50-64 and live in a suburb. At 57%, this group is also more likely than the average American (44%) to think ads in general are a waste of time.